Unit is designed for a 3,500# product capacity. Product contact surfaces are designed to withstand corrosive Chloride powder material. Frame is adjustable for future flexibility, and finished with Steel-It stainless steel pigmented epoxy. Inlet tube constructed from B265, grade 2 Titanium. Viton inflatable spout seal assures a dust-tight seal to bag inlet. The manual inflation control is mounted to the frame. Manually adjustable “drive off” style bag loop hangers. 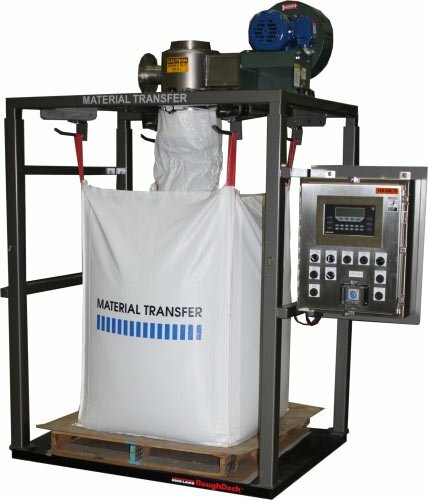 Bag inflation system includes a 750 CFM blower with 1.5 HP TECO Max E2 severe duty motor. Programmable Rice Lake digital weight indicator with appropriate relay controls. NEMA 4X stainless steel enclosure houses momentary control switches and digital weight indicator. NEMA 4X stainless steel summing box for load cell units.